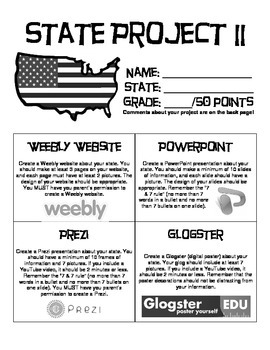 An outline for a State Research Project that includes 4 digital project options, a checklist for students to follow, and a rubric for the teacher to grade. Student choice is built in to the project by allowing students to choose their method of presentation and through the "optional" categories, where students choose the information they are most interested in learning about. All 4 project options involve building technological skills while presenting research. Recommended to follow "State Research Project" (rubric & resources in my TpT Store! ).